A large and slow-moving storm brought heavy rain to much of the eastern half of the nation on Saturday. 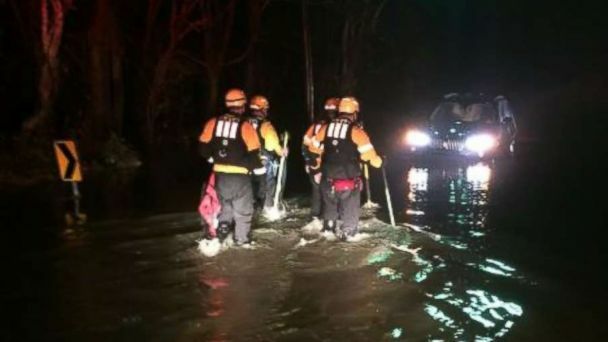 Rainfall between 2 and 2.5 inches caused some flooding in the Washington, D.C., area on Saturday prompting water rescues in some flood-prone spots. The rain there comes as Washington, D.C., officially set their wettest calendar year on record. The additional rainfall on the East Coast also officially pushed Wilmington, North Carolina, over 100 inches of rain for the year -- more than a foot and a half above its previous record. The storm is moving into the Northeast on Sunday morning. The immediate concern is that the precipitation is pushing into colder air in parts of the interior Northeast. Temperatures near the freezing mark are likely Sunday morning in metro areas from Buffalo, New York, to Hartford, Connecticut -- including parts of New York's lower Hudson Valley. Precipitation is likely to fall in these areas as a mix of rain, freezing rain and some snow. For those heading out on Sunday morning, roadways and sidewalks are likely to be slippery in spots. As the storm slowly moves east, it will pull in colder air behind it. Precipitation will continue to be a mix of rain, snow, sleet and freezing rain in parts of the interior Northeast through Sunday and into early Monday. No accumulation of frozen precipitation is expected in major I-95 cities. Heavy rain is expected from New York to Boston through parts of the day Sunday. The storm will pull away from the Northeast on Monday. Due to the risk of icy roads, and some snow, there are winter weather advisories posted for parts of the Northeast. Ice will generally accumulate from a glaze to nearly one-tenth of an inch. Snowfall accumulation should be limited to the northern parts of New England, where locally over 6 inches are possible. After strong winds on Friday night, a Pacific storm will move onto the West Coast Sunday. The storm is bringing mainly heavy rain from Central California to Washington. In the higher elevations of the region, mountain snow of 1 to 2 feet is expected. Another Pacific storm is lurking behind this one, and it will bring another round of heavy rain and some snow to the western mountains. Rainfall totals through Wednesday could exceed 6 inches in spots on the West Coast. However, this region of the country typically sees copious amounts of rainfall this time of the year. The most notable trend in the weather going into this week looks to be mild weather spreading from coast to coast. The jet stream will keep concerning weather north and allow milder air to reside across much of the U.S. Temperatures as we head into parts of this week will likely be 10 to 20 degrees above average in parts of the western and central U.S.
A peak ahead to the holiday period shows that this air will reach the East Coast later this week, with mild temperatures likely from coast to coast through the end of December.